A local charity had a sale these last few days. They had a sale on picture frames. I don’t usually buy frames unless they are something very special, I am more concerned with what they hold and display. I purchased several frames with artworks included. Once again I buy because the artwork catches my eye and says something to me. So what did I buy. I bought a watercolour, an aquatint, and a pen and wash drawing. I’m sure these are not worth much money but they did catch my eye. The first is what I consider to be a lovely and evocative watercolour by Beatrix Holm. This scene reminds me very much of some dear friends who have moved to Wales and live in countryside much like what is pictured here. Rolling hills, farms, winding roads, and copses. There are no sheep in this picture but there are where my friends live. An idyllic place into which one can see oneself retiring after ones working days. Walk the hills, enjoy a picnic lunch, watch clouds sail by, rest, relax and feel the wind on your face, the vitality of life which surrounds you and then to home to revel in and absorb the experience which you have just had. An experience one could have every day. Many artist specialize in one medium although they may experiment with others. Beatrix Holm delved into aquatinting. Aquatinting is done by the application of acid to make marks on a copper or zinc plate. Aquatinting then uses a powdered rosin to create a tonal effect. The rosin is acid resistant and typically adhered to the plate by controlled heating. The tonal variation is controlled by the level of acid exposure over large areas, and thus the image is shaped by large sections at a time. It is this exposure to varying amounts of acid which creates the different tones in the image. One can also etch onto the plate (before the acid exposure) an outline of the image or any aspects of the image which one might like to add definition to. 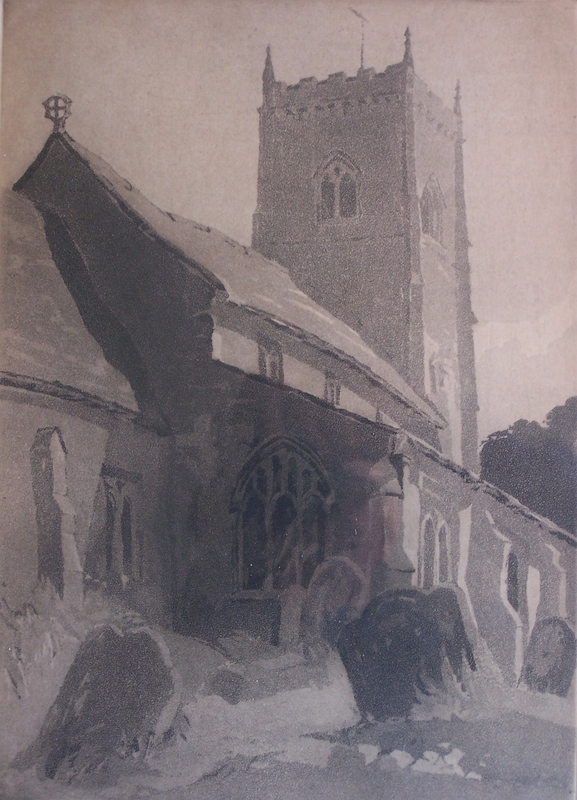 Here is an aquatint of Barwick in Elmet Church in Yorkshire. The difference in tonality is plain to see but it does not appear that Beatrix Holm etched an outline or any other defining lines onto the plate. The church is seen from the north on which lies the cemetery. The tower of the church was used as a lookout for any enemy parachute incursions during WWII. One can visit the church today. 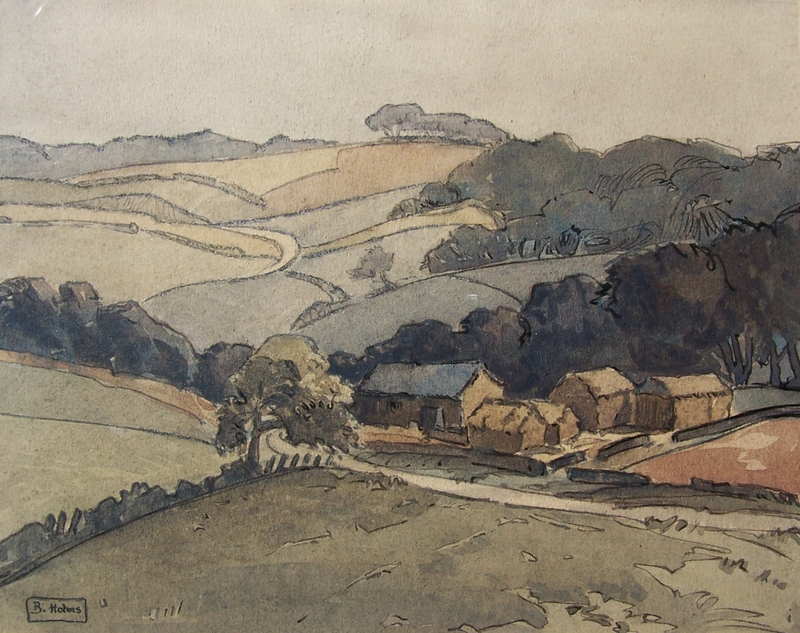 I’m not sure how old this aquatint is but my guess would be that it was made around 1930. And just for fun I will throw in a pen and wash drawing also. 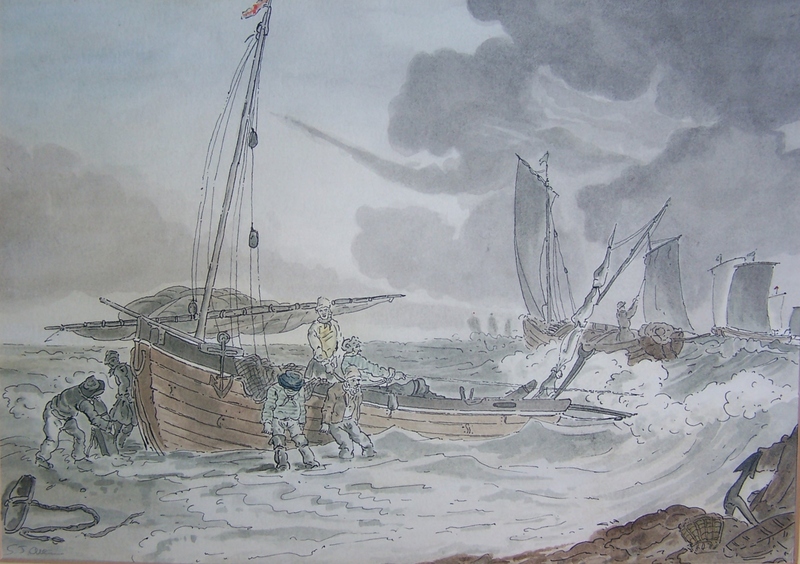 It is titled ‘Storm off the Fylde Coast’. The Fylde (Scandinavian for field) Coast is a coastal plain in western Lancashire. The city of Blackpool lies in the Fylde Coast. pen and wash drawing by S J Ath??? This entry was posted in Drawings and Sketches, Etching, Watercolour paintings and tagged barns, Barwick in Elmet church, cemetery, copses, farmland, Fylde coast, hills, rigging, sailors, ships, storm, storm clouds, tomb stone, tower, waves. Bookmark the permalink.